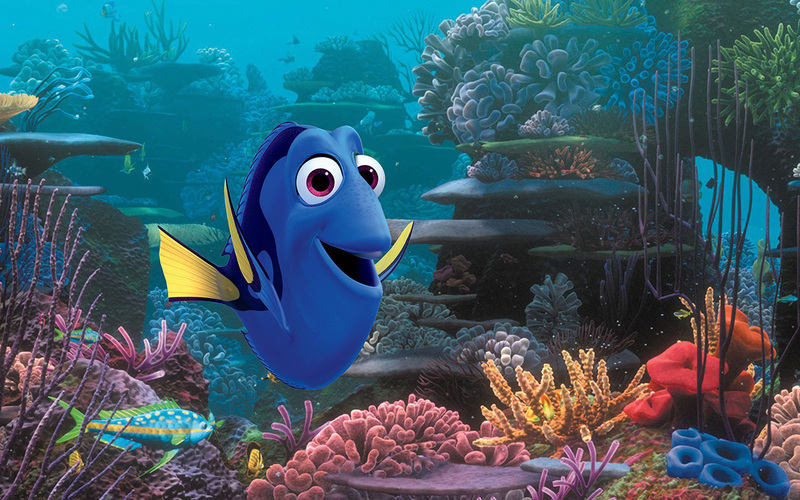 “Just keep swimming, just keep swimming,” said Dory, the little blue tang in Finding Nemo, the 2003 Disney/Pixar hit about a father clownfish’s across-the-ocean search for his abducted son. And keep swimming she has—Dory now splashes right into her own movie, a sea-worthy spin-off about her own search for the loving parents she barely even remembers. 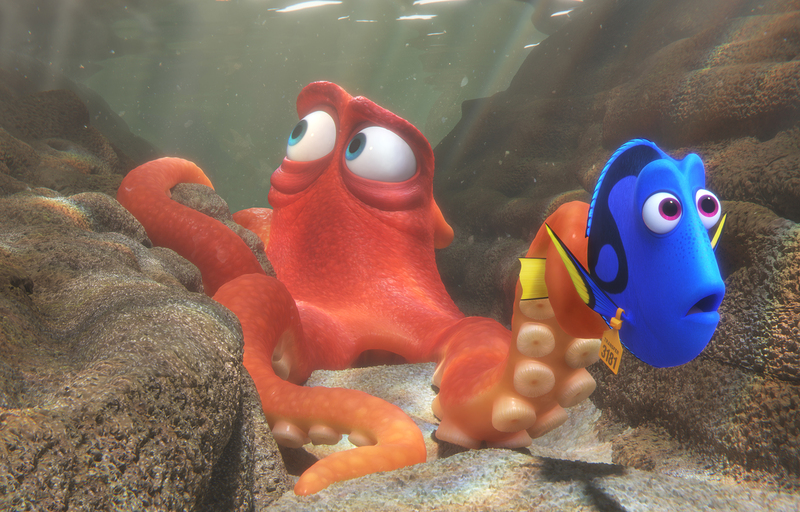 In Finding Dory, which takes place one year after the events of Finding Nemo, Dory—still coping with her lifelong inability to remember anything—suddenly recalls a memory fragment of her mother and father (Diane Keaton and Eugene Levy). Overjoyed that she has a family, she sets out on a quest to locate them, bringing along young Nemo and Marlin, his reluctant dad. Ellen DeGeneres once again provides the voice of Dory, with a perfect grasp of the delicate emotional shadings of comedy, drama and trauma in her struggle to piece together the shards of her past as she leaves her colorful coral reef and heads to the dark, debris-clogged shores of California. Albert Brooks reprises his role as Marlin, and newcomer Hayden Rolence is Nemo. 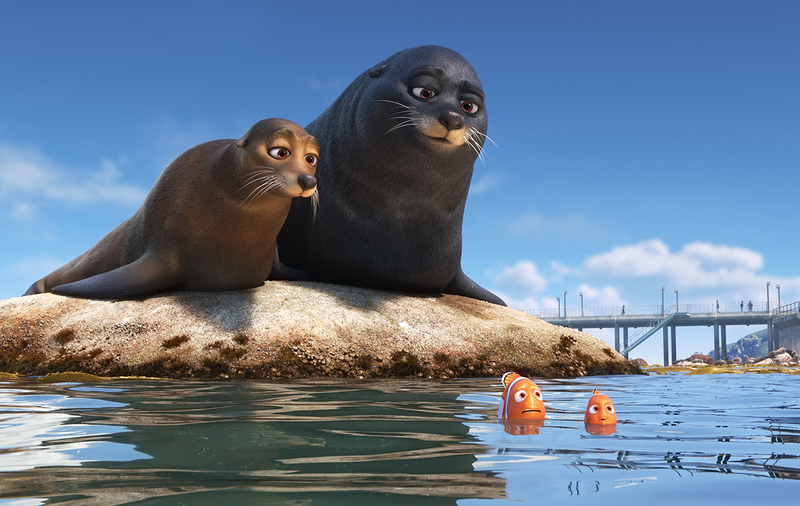 The new movie does a great job, just like Nemo, of creating a world teeming with aquatic creatures—although we meet most of them not under the sea, but inside a marine institute, which is where Dory, Nemo and Marlin eventually come to the surface. Two sea lions (The Wire’s Idris Elba and Dominic West) fiercely guard their rock from interlopers. Ed O’Neill is a hoot as Hank, the misanthropic camouflaging “septopus” (an octopus with only seven tentacles) who longs to remain in captivity rather than return to the wilds of the ocean. Modern Family’s Ty Burrell cracked me up as Bailey the beluga whale, so proud of his abilities of echolocation, the sonar-like location of objects by reflected sound. Paired with Destiny (Kaitlin Olsen from It’s Always Sunny in Philadelphia), a nearsighted whale shark, they’re quite a team. There’s a road full of adorable otters, a loveably dorky ocean loon, Becky, who doesn’t say a word, and a great running joke about real-life actress Sigourney Weaver, who’s heard but never seen. From the opening Pixar short (Piper, about a little sandpiper) to the credits (when Hank the octopus gets one last time in the spotlight), it’s all great fun, rollicking adventure and quite heartwarming. Director Andrew Stanton, who also steered WALL-E and Finding Nemo, and co-director Angus MacLane keep the pace lively, the jokes funny and the message clear: Friends are family, too. There may be tears, and little ones, especially, may be more affected than grownups about Dory’s wrenching separation from her parents and her unflappable hopes that she will find them. This is, after all, the House of Mouse, the company that gave us Bambi, Pinocchio and Dumbo—not to mention Old Yeller, The Lion King and that flashback scene in Up. But remember what Dory says: Just keep swimming, just keep swimming. You’ll make it.